get killed on the way. For this mission I want to be very defensive. 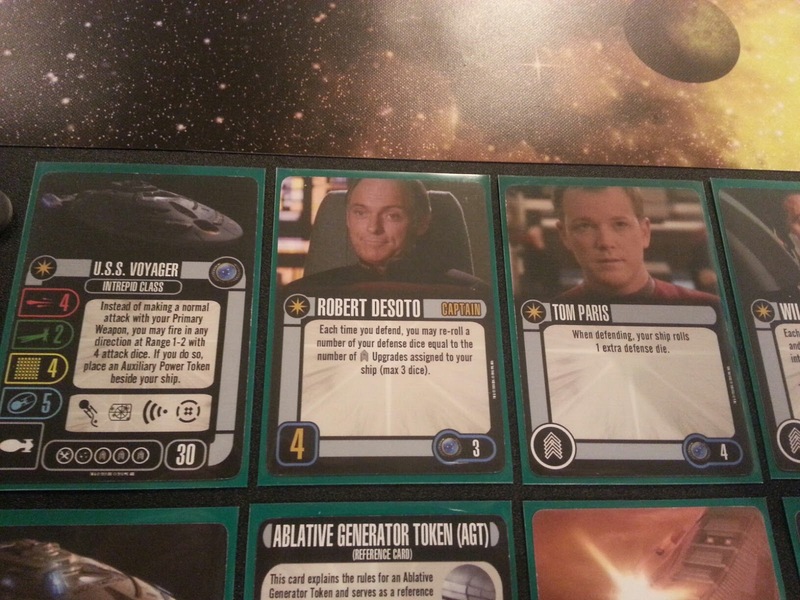 For my Captain I took Robert Desoto. He gives me re-rolls for defence. 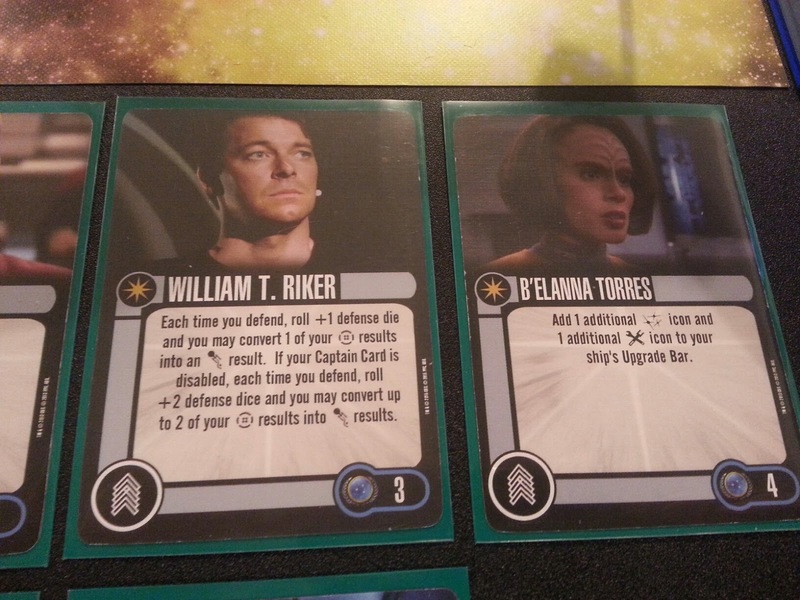 For Crew I took Tom Paris (+1 Defence), William T. Riker (also gives me +1 Defence and allows me to swap a Battle stations for an evade.) 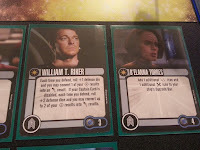 and B'elanna Torres for more upgrade slots. 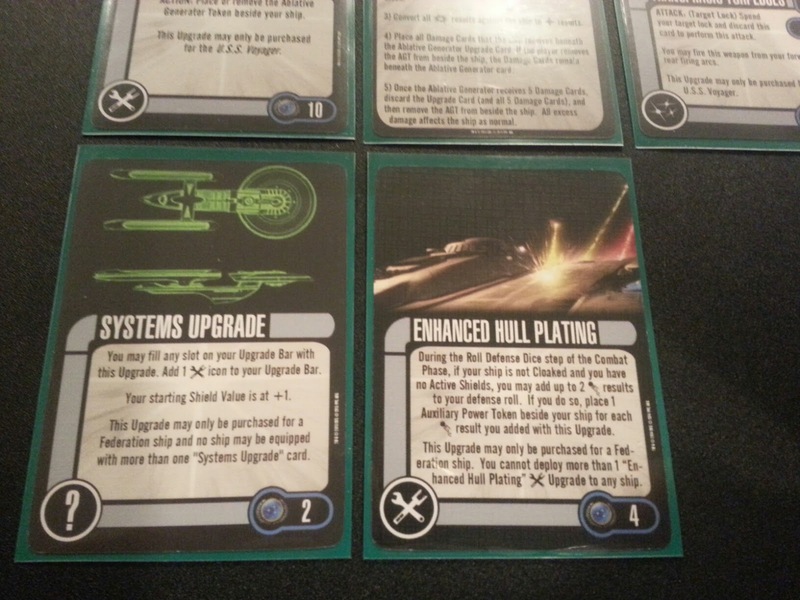 To finish up this build I add Systems Upgrade as my last weapon slot and gain a shield as well as an extra Tec slot. 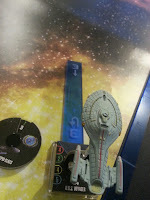 lastly I grabbed Enhanced Hull plating to use up my last 4 points. I now have my 75 point ship, and man is it good on defence, 4 defence dice with re-roll and Enhanced Hull plating to pick up the slack. 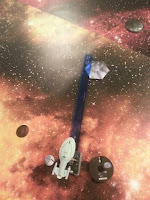 The Borg ships, they work a bit differently than normal borg ships. 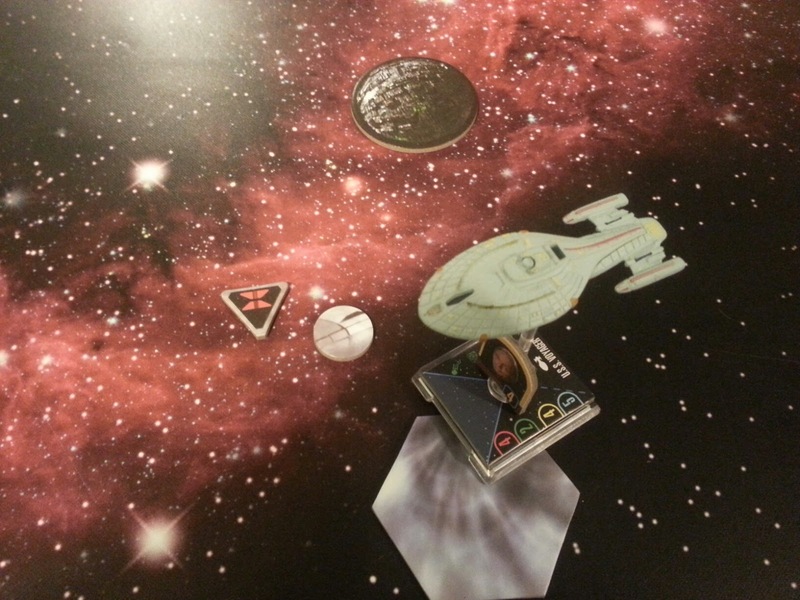 They cannot move and each turn if you are in range they will do a Tractor Beam action against your ship. The Borg Cube Tractor Beam is range 2 and does nothing if you have a Ablative Generator token. The Sphere Tractor Beam is range one, it limits your movement to 1 moves and takes away an attack die, if you have a Ablative Generator token. 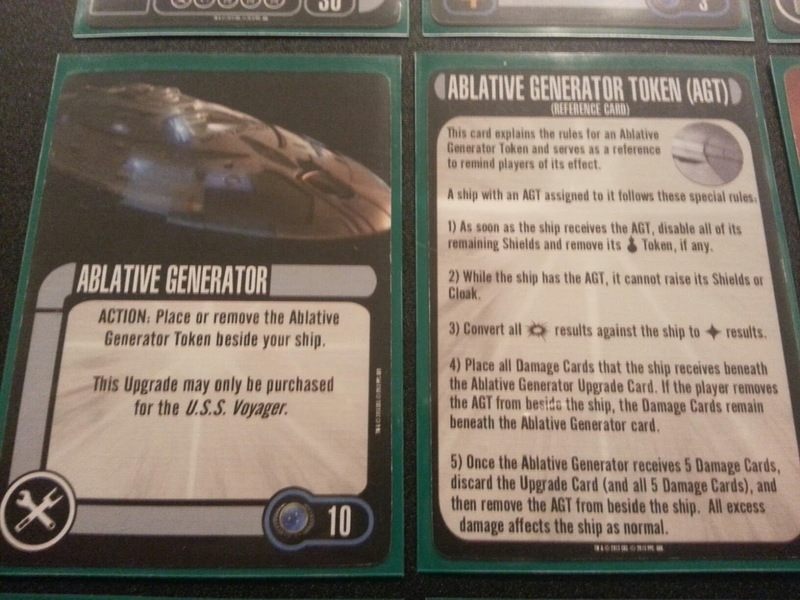 If you don't have a Ablative Generator token for any reason you lose the game as soon as you get Tractor Beamed by either of the two ships. 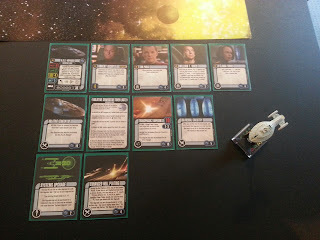 If you score a critical hit on any of the borg ships instead of dealing a faceup damage card you instead deal 2 face down cards. The Cube states are 10 attack, 0 defence, 10 Hull and 10 shields. 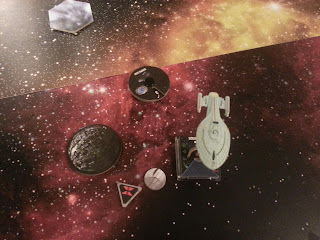 The Sphere states are 6 attack, 1 defence, 6 hull and 6 shields. The Conduits have 6 hull and 6 shields. I started off in the corner to avoid being hit by two cubes, I move 3 forward and target locked the closes cube. I rolled five defence dice, got 2 Evades, 2 battle stations and a blank. 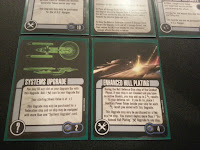 I re-rolled one Blank and one battle stations using my commander, rolled another battle stations and an evade. 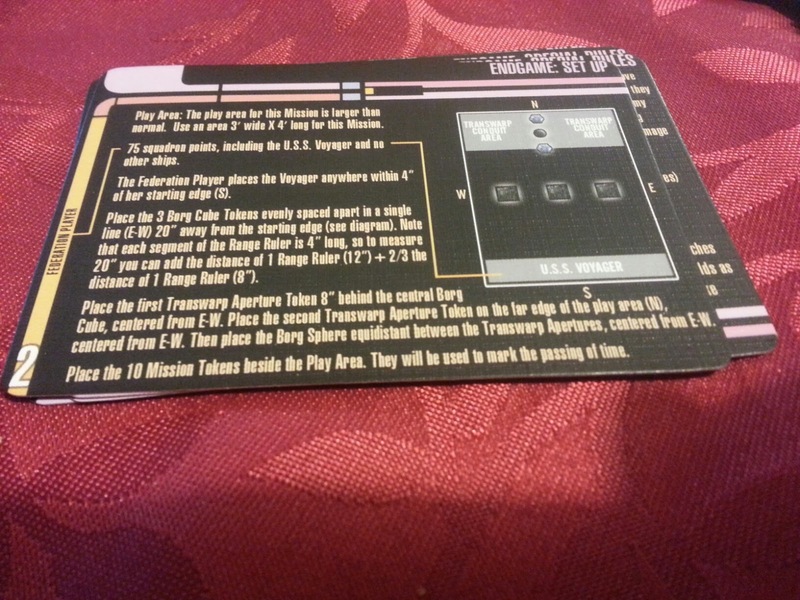 I used Riker to convert one battle stations to an evade for a total of 4 evades. In the end I took one hit to my shields. I then fired back with my normal weapons forgetting that my torpedoes ignored shields, my shot failed to hit and i decided to save my Target lock for next turn. I made a one right bank, I activated my Ablative Generator so that in my next turn I would be immune to the Borg cube's Tractor Beam. The borg ship attacked, scouring 4 hits and 2 critical hits. I rolled my defence and after using all my abilities I scored 3 evades and took 3 damage. 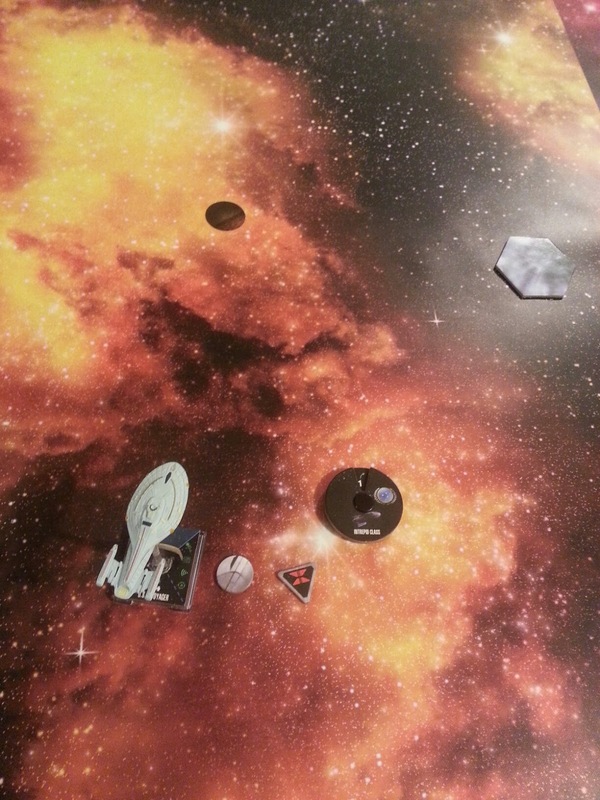 I attacked back this time remembering my Torpedoes. I scored 3 hits and 2 critical hits, the borg took 7 damage not bad. I made another mistake and took a 1 bank left, this put me really close to the Borg cube. In the rules if you pass through the cube or land on it you lose. I had to kill this thing this turn. I took a target lock as my action. 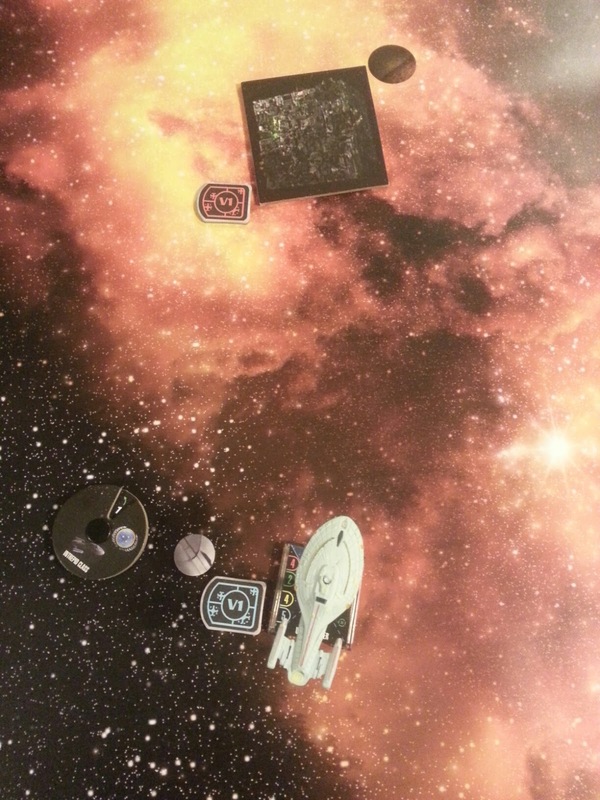 This time two borg cubes were in range of me. The center one attacked scoring 6 hits. I rolled my dice and scored 5 blanks! 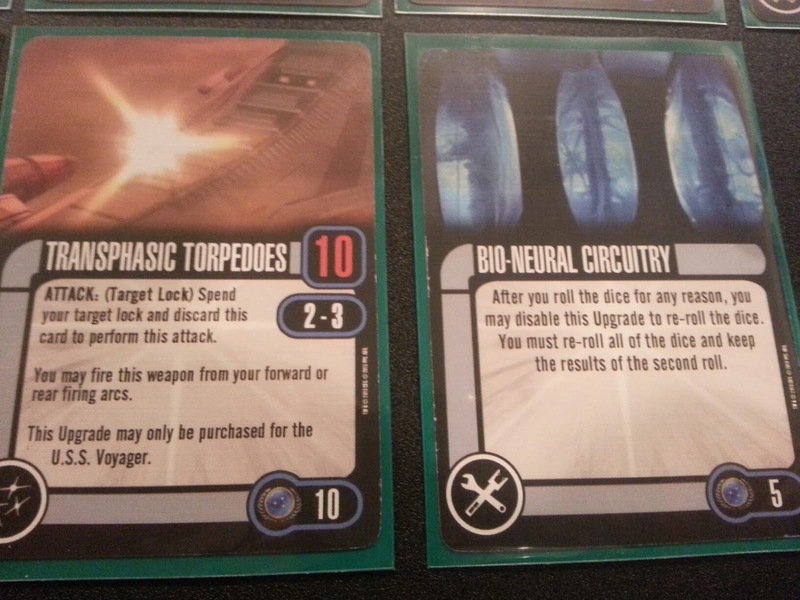 I used my Bio-Neural Circuitry and scored 4 evades, only taking 2 damage. 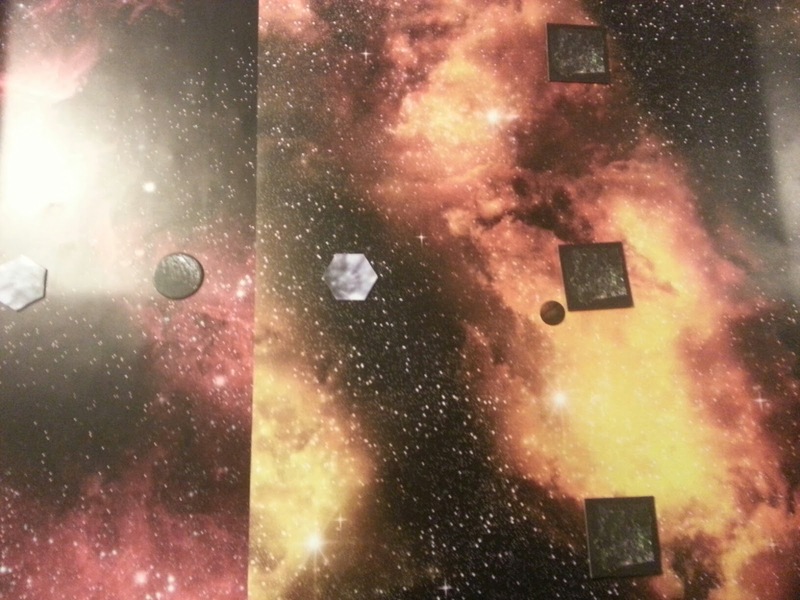 The second cube fired, this one was at close range so it got 11 attack dice, it only rolled 2 hits and 2 critical hits. I rolled my defence and using my crew upgrades i was able to get 4 Evades. I fired my Torpedos at the closes cube and destroyed it doing a total of 8 damage. I did a 1 bank to the left moving on to the next cube, then I target locking it. The cube fired scoring 4 hits. I rolled my dodges and used my crew to get three evades, I then used my Enhanced Hull Plating to cancel the last point of damage. I attacked back scoring only 3 hits, yikes! only 2 torpedos left! 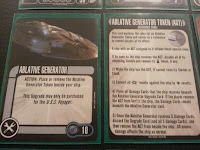 I also now had an auxiliary power token thanks to Enhanced Hull plating, I figured its better to use it now so that i didn't lose my Ablative Generator. 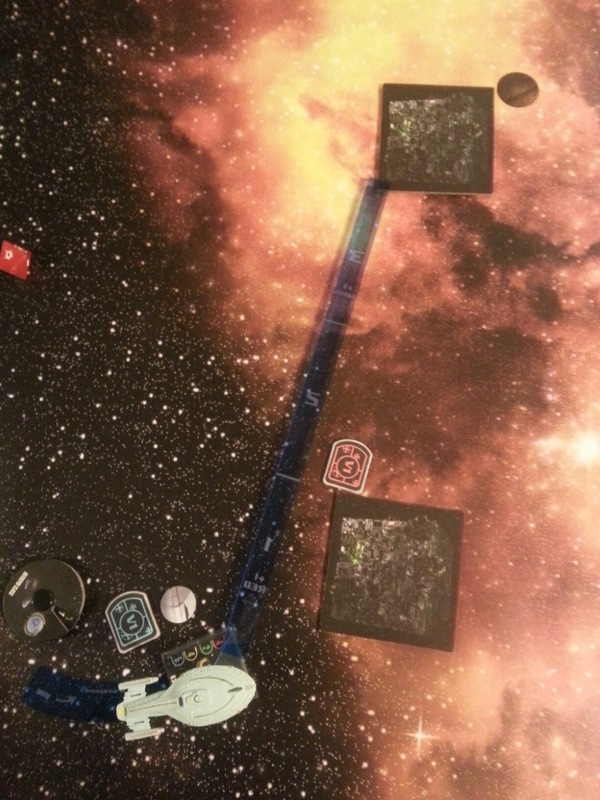 Once you lose the Ablative Generator any tractor beam action means I lose the mission, so I have to negate as much damage as i can to keep the Ablative Generator active. This turn I did a simple 1 forward, to get rid of the Auxiliary power token, I then Target locked the cube. The cube fired, scoring 3 hits and 2 criticals. I rolled my evade dice only scoring 2 evades in the end and taking 3 damage bringing me up to one lost shield, and 8 damage on my Ablative Generator card. I fired back scoring 6 hits and 2 criticals for a total of 10 damage! That's another dead Cube. I moved into position to go through the gate, and re-enabled my Bio-Neural Circuitry. I decided I wanted my Voyager to get home, so I need to go through the conduits. To do that I had to go through the lower conduit to that part of the table, if I missed I would lose the game, So I choose to do a speed six, I was pretty sure I was lined up, and luckily for me I was right. 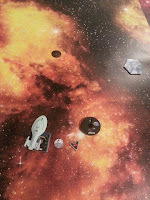 I moved though it, though I was hoping to land on it, if you were on the token you cannot be attacked by the sphere. The Sphere attacked, scoring 4 hits. I rolled my defence dice and scored 3 dodges. 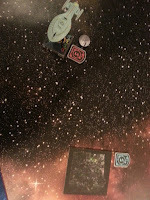 Voyager takes another damage. 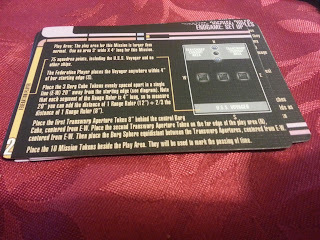 I attacked back using Voyagers ability to fire out of arch scoring 3 damage to the sphere's shields and gaining me a Auxiliary power token. I took a three bank right maneuver bringing me closer to my end goal, the second Conduit marker, if I land on it I win the game. Being at range one of the sphere means if it scores 3 hits this turn I will lose my Ablative Generator and in the next turn the sphere tractor beam will cause me to lose the game. 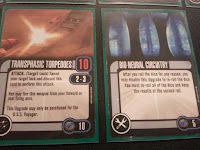 The Sphere attacked and scored 3 hits and 2 Criticals! I roll my dice, I roll one evade and three blanks. I use my captain to re-roll 3 of the dice and gain 1 more evade and a battle stations, I then used Riker to change the battle stations to an evade, only taking 2 damage. Few! Well I am tractor beamed this turn so I can only make range 1 moves, but that is enough to get me on the conduit and win the game! Next time I will go for a major victory! I really like my build for this mission, I ended up using all my cards, and each one did its part to win me the game.